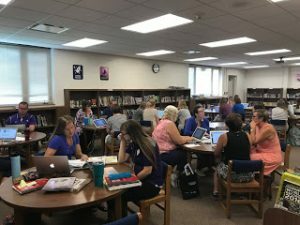 The beginning of the 2018 school year looked a little different for Nevada CSD teachers regarding professional development. As we have been embarking on personalized learning for students as part of the Competency Based Education (CBE) collaborative, it became evident that asking our teachers to think differently about the learning needs of their students would require us to think differently about our teachers’ learning. We wanted to base our professional development on individual teachers’ needs and interests that would allow them to reach their individual goals and the goals we have as a district. Starting last spring we surveyed all our teachers: what did they want to learn more about? What did they want to explore or experiment with in their classrooms? We have arranged our professional development schedule throughout the year so teachers will have time to continue to work on what they need to work on to meet those individual goals that will impact their classroom. Teachers have the autonomy to select their own Individualized Career Development Plan (ICDP) focus area while being supported by their colleagues and peers. Additionally, several license renewal credit options are available for staff, which they are able to choose based on their own interests and needs as an educator. Through these efforts, we have put in place a truly individualized learning environment for our staff called Climbing the Mountain. In this framework, started by Jarod Bormann (Keystone AEA Technology Integration Specialist), teachers are given time and support to make the changes that will truly impact student learning. During professional development time, teachers have the option to attend base camp sessions where they can learn some of the basics of different platforms or strategies to make changes in their learning environment. From there, individuals determine a weak spot in their teaching they want to improve. Then, they work with their instructional coach to research multiple resources and strategies that will help them make the changes in their classroom. Once they have researched their topic from multiple angles, they decide on the best way to implement their learning in their classroom. They gather data on the impact in their classroom, then share the results with peers in a presentation both within and outside the district. During this entire process, they can ask for additional base camp sessions to support their learning and also work with their instructional coach and technology integrationist to help them guide, plan, implement, and reflect on the process. Once the educators reach different levels of their journey, we recognize them with recognition ceremonies. Ultimately, the goal is for positive change within classrooms and for teachers to have the time and support to take risks in their learning environments. The results and feedback from our staff have been truly amazing, and we are seeing staff collaborating around shared goals like never before. The journey to truly personalize and individualize teaching and learning for our students has to begin with honoring our teachers as learners. Click here if you would like to know more about the Climbing the Mountain process. Originally Shared by Carrie Hillman on the Nevada Individualized PD Blog.